Aunt Joan stands next to my Mom Jacqueline, who is holding her well-wrapped three-week-old niece and godchild Kathy. The photo was taken outside of Joan’s home on 9 June 1968. That’s the day when Katherine Anne, first child of Lino and Jeanne d’arc (Joan), was baptised at Sacred Heart RC Church in Timmins. Kathy’s godparents were her maternal aunt Jackie and her paternal uncle Rino. I love the 1960s fashion. Mom and Aunt Joan wear a single-strand pearl necklace, Mom has gloves and I’m sure Joan did too, although we can’t see them in this picture. My sister Marianne and I probably attended our new cousin’s baptism ceremony and the small family get-together afterwards, but I don’t have any memories of the day. 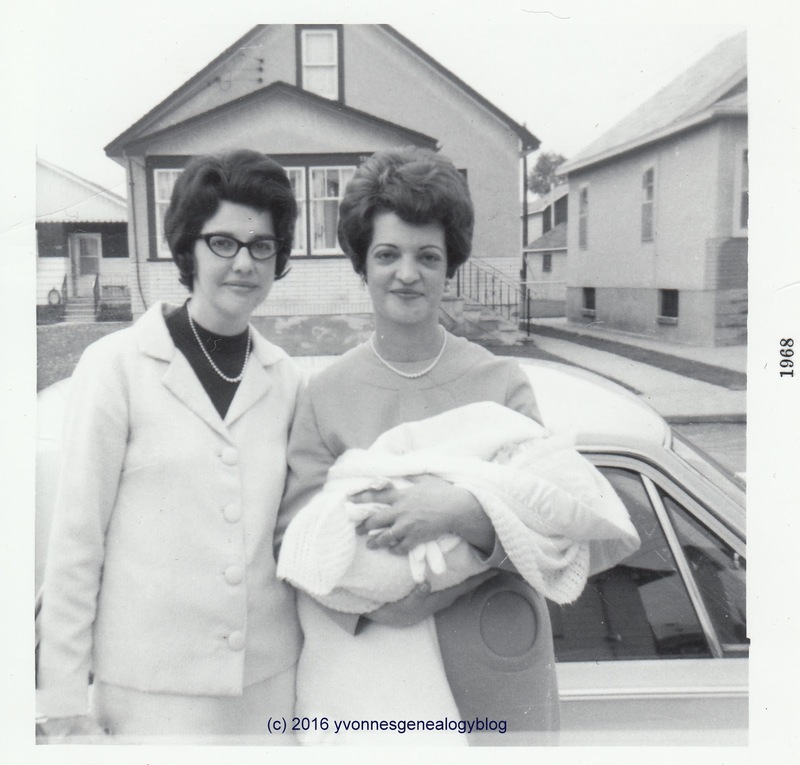 The photo was in Kathy’s family album and she let me scan it when I visited her in May 2014. It’s a touching memento of her with my Mom as her godmother.